A good mic stand isn't the most glamorous addition to a studio, but it's certainly a worthwhile investment. We've all been frustrated by mic stands that can't support the weight of a large mic and droop during a take, or aren't quite tall enough to serve as a drum overhead, and topple at the slightest provocation — or, of course, the mic stand that's rendered useless by someone with the grip of Lou Ferrigno on one of his grumpier days! This is all avoidable if you're prepared to invest in a decent mic stand, and Sontronics' Matrix 10 is one such stand. It's sensibly engineered, easy to adjust and maintain, sturdily constructed and very versatile. There are four main components: a removable wheeled base, a main tripod stand, a counter-weighted boom arm, and a vertical hanger arm. A well‑written, illustrated assembly guide is also included. The wheeled base is supplied folded up in a soft carry case, and can be quickly opened and locked to provide a three‑spoked frame with rubber-tyred wheels. Each wheel is equipped with a footbrake, and corner brackets on the tops of the legs trap the feet of the mic stand, which can be held securely in place with thumbscrew clamps. Fitting the tripod to the dolly adds 10cm to the overall height of the system. The main tripod stand is usefully lightweight, thanks to its brushed‑aluminium construction, though the reflective surface won't earn it many friends in TV, stage and theatre applications. The marketing blurb claims that the Matrix 10 can support up to 6kg, or the weight of 20 AKG C414s. That figure doesn't sound enough, when you consider that the boom counter-weight is 3kg, and the heaviest mic on the market (the admittedly huge AEA R44C) a shade over 4kg, so I decided to see how sturdy the tripod stand really is. I extended the centre pole to its full limit, and hung from it a large canvas bag, which I progressively loaded with bags of sugar and flour from Mrs R's kitchen stores. I ran out of convenient products at 12.5kg, but the stand showed no sign of wanting to collapse or even slip — and it still took considerable pulling effort to force it to slip downwards — so we can safely call 6kg an extremely conservative figure! The main tripod has a single extension section, which raises the height from 1.12m to 1.7m. The clamp mechanism is very elegant, and uses a simple, small, spring‑loaded lever that rotates over a 90‑degree arc to release or clamp the extension tube. It has a positive action, is very fast and easy to operate, and neatly removes the potential risks posed by Ferrigno wannabes! It's also fully adjustable, should wear and tear make that necessary. The top of the extension tube carries a removable lighting spigot, clamped in the same away as the extension tube and terminated in a 3/8‑ inch standard mic thread, protected by a rubber cap. The boom is attached to the main stand's extension section via a huge ABS double collar, with two large lever handles. One allows the collar to be raised or lowered on the tripod stand, and the other allows the angle of the arm to be adjusted relative to the vertical stand. The collar surfaces have interlocking radial ridges to prevent any 'droop' once the correct angle has been set, and the large lever handles allow more than sufficient pressure to be applied, even for the most feeble of wimps! The boom arm has a single extension tube, clamped with another 90‑degree lever, extending the arm from 1.2 to 2.25m. Placing any mic at that kind of reach will create balance issues, but a 3kg cast‑iron counter-weight is provided, and can be slid along the rear of the boom arm to achieve a perfect balance and centre the weight on the main tripod stand. Another large lever handle provides the clamping mechanism, and a bracket fixed with four Allen bolts ensures the weight won't fall off accidentally. Again, a 3/8‑inch threaded spigot is retained at the end of the boom arm with another 90‑degree clamp lever. Frustratingly, though, this is smaller in diameter than that in the tripod stand, so they're not interchangeable. 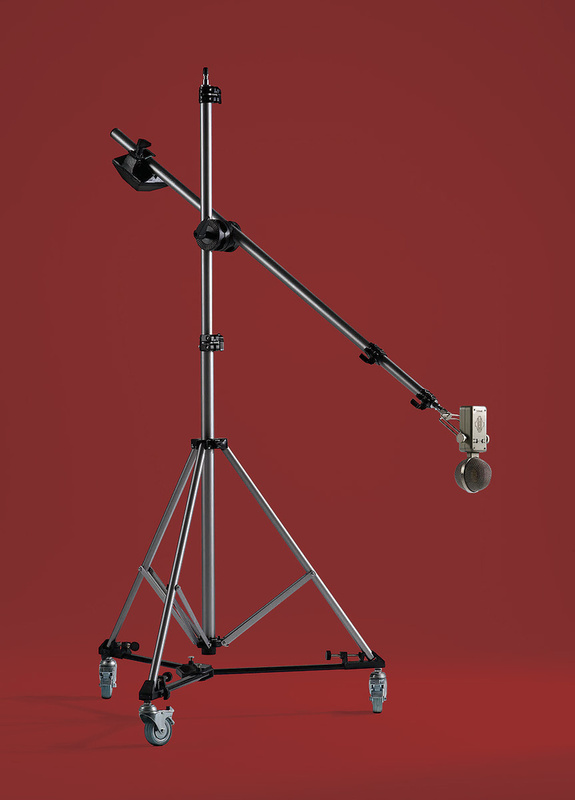 Unlike most stands, the Matrix 10's boom‑arm extension does not rotate, which would make attaching mics rather difficult if the threaded section was part of the arm. Instead, the removable spigot can be screwed easily into a microphone's shockmount or bracket, and then quickly and easily clamped into the extension tube. The vertical hanging extender does as its name implies. It can be used (optionally) to support the mic 20‑30cm vertically below the top of the boom arm. It's not an essential accessory, but it can make it much easier to attach a large shockmounted mic while keeping the boom arm well above the talent. The drop‑arm screws on to the removable spigot at the end of the boom arm, and an adjustable rotating clamp (again with radial ridges) ensures a stable angle, once set. The vertical tube has a conventional rotating clutch‑clamp arrangement to fix the inner extension tube (allowing the length to be adjusted between 20 and 30cm), and a 3/8‑inch thread at the end of the extension tube allows mic supports to be attached. This is a large stand, and not what you'd normally want to hold a mic in front of a guitar cab or acoustic guitar, but for vocal work in a large studio space, drum overheads, grand pianos, or orchestral work, it's ideal. Being able to wheel it about in a large studio makes it quick and easy to experiment with mic positions, or to place the stands safely after the musicians are seated. The considerable height and reach, with the counter-weight, mean it's easy to hang mics over drum kits or other large instruments without fear of toppling or crowding the musician. It's easy to set up, totally stable, and reaches as far as some of my hugely heavy traditional K&M steel tripod stands. I've long been trying to locate a European source of vertical hanging, with little success, so its inclusion is a bonus. It may not seem that useful at first glance, but when recording vocals it makes it much easier to set up a mic above the singer, and it's handy when hanging mics from above in other applications, too. The Matrix is expensive, but the price is comparable to the broadly equivalent K&M stand and boom combination which I normally use for similar applications — and the K&M is much heavier, can't be used with a wheeled dolly, and doesn't come with a vertical hanger. So the Matrix 10 is actually excellent value for money: I highly recommend it. K&M's 21411/21231 and ST212, the Ultimate Support MC125 and the Latch Lake MicKing 3300 and 2200 are all worth investigation. They're all black, which is important in some applications, but not all can be used with dollies, and some are rather heavier or pricer than the Matrix 10. Which is best for you will depend on your requirements. Includes wheeled dolly and vertical hanger. Simple but robust extension-section clamps. Good height and huge boom reach, with practical, adjustable balance weight. Finish won't be popular in some applications. This versatile, lightweight mic‑stand kit has a huge reach, and includes some very useful accessories. Sontronics +44 (0) 1202 236862.